Kohlrabi belongs to the brassica family of vegetables (cabbage, cauliflower etc.). Unusually the part we eat is the swollen stem which grows just above ground level. The leaves can also be eaten as greens although they have a strong taste which some find a bit overpowering. They do suffer from the same pests as other brassicas, the Cabbage White being the most common. But in general, kohlrabi are not the plant of choice for most pests so they are a normally trouble free. There are two common types of Kohlrabi, those sown in spring which tend to be green and those sown in summer / autumn which tend to be purple. The purple types are hardier and can often be left in the ground up till December time especially if you can provide cloche protection or grow them in polytunnels / greenhouses. A well-drained soil which has been well dug to include lots of well-rotted organic material. Do not add manure to the site before sowing seed. Kohlrabi prefer a neutral to slightly alkaline soil. They don't do well on acid soils. See here for more about soil acidity / alkalinity. They grow equally well in full sun and partial shade. They don't like dry soil however so if that might be a problem on your plot, position them in partial shade where the soil will remain moist for longer. This is the easiest method for a spring sowing although for an autumn crop the seed should be sown directly outside as described in the next section. Over fill the seed module tray with good quality multi-purpose compost which has had all the lumps removed. Firmly tap the filled tray on a solid surface a couple of times to settle the compost but don't firm it down. Scrape away the excess compost from the surface so that the compost is level with the top of the modules. Use a pencil or a your little finger to make a hole in the compost of each module about 2cm deep. Drop one seed into each hole and sprinkle in a little compost over the seed so that the compost is again level with the top of the module. Water the compost and place a marker in one module showing the sowing date and variety name. Place the seeds on a windowsill or any light and airy position where the temperature is in the range 50°F / 10°C to 80°F / 27°C, room temperature is ideal. Kohlrabi seeds will germinate in temperatures as low as 40°F / 4.5°C. The seeds will germinate in about 10 days and be ready for planting outside in four weeks from the date the seeds were sown. They don't need to be potted up or fed, they will grown fine in the modules until planting out. The plants will be ready for hardening off about four weeks after sowing seed. Hardening off is simply the process of gradually acclimatising the plants to outside conditions and should take a week or so. More detailed information about hardening off plants can be found here. The plants will be about 8cm high when they are ready for planting out. If you have prepared the soil (i.e. well dug) as described above, planting the seedlings out is simple. First work into the top of the soil a handful of blood, fish and bone per square metre. Tip the plant out of the module and plant it in the ground gently firming the soil around it. Each plant should be 30cm / 1ft apart and if planting more than one row, the rows should be 25cm / 10in apart. It's important to get the planting depth correct with Kohlrabi. They need to be planted to the same depth in the ground as they were in the compost of the module. This is particularly important because the edible part of kohlrabi is the stem just above soil level which swells into a small ball shape. If the stem where the ball forms is partially or fully below soil level it will rot. Plant as described above and then water the them in well. Kohlrabi can be sown outside either for an early summer or autumn crop, see the calendar above for precise dates. Kohlrabi has an excellent germination rate even in cold conditions so there is no need to sow the seeds densely. Before sowing prepare the soil by digging to a fine tilth and add one handful of blood, fish and bone per square metre. Make a groove in the soil about 1 to 2cm deep and sow one seed every 5cm / 2in. Cover with soil and water well. If planting more than one row, the rows should be 25cm / 10in apart. The seedlings will appear in about ten days time and should be thinned to 30cm / 1ft apart. You could spread a handful or so of blood, fish and bone per square metre around your plants once a month but in truth they should be OK on any reasonable soil. Do water the plants in dry weather conditions because lack of water will lead to woody stems. They need more water compared to most other plants. To help with water retention a mulch around them will do wonders. Grass cuttings are an ideal and cheap solution which will also slowly rot down and provide a small amount of nitrogen feed. Read the seed packet to work out how long your variety will take to mature but in general they take fifteen weeks or so from seed sowing to maturity. One plant will give you one Kohlrabi. In theory you can leave the stems until they are 15cm or so wide and they should still be tender and very edible. But to do that you will need to have maintained a very even and constant moisture level in the soil. It's probably best to harvest them when they are 5cm to 8cm wide (about the size of a tennis ball) if the growing conditions are not perfect. To harvest, grip the swollen stem and gently tease the roots from the ground. Try not to disturb the plants growing at either side. To prepare Kohlrabi for eating fresh or steaming cut the leaves off. The leaves are an edible green and should be treated as if they were kale. Cut the top and bottom stems off just slightly into the main swollen stem. Peel off the outer skin, larger stems will have thicker skins compared to smaller and more tender stems. The Kohlrabi is now ready for eating. They are best eaten within 24 hours to maintain the tenderness but will store for four of five days in the fridge. Kohlrabi is a biennial plant which means it grows in year one but only produces seed in the second year. So, in order to get the seed you will need to overwinter the plant. Most areas of the UK are too cold for the plant to survive through winter although in warmer areas it may be possible. If the plant survives winter it will start to produce yellow flowers in May time on the ends of large stalks. The flowers will then die down and long thin seed pods will begin to form. At this point the plant will have grown to about 1.5m high and this is another problem. April / May winds in the UK can damage the plants significantly so the overwintered plants need to be a protected position. The green seed pods will turn brown in June or July and the seeds can then be harvested. One plant will produce hundreds of seeds. Only open pollinated Kohlrabi is worth it for saving seeds, the quality of seed from F1 plants will be very variable. Given the problems of overwintering, wind damage in spring and the space occupied by the plants when fully grown it's only the most determined who will try saving Kohlrabi seeds for themselves in the UK! After all, a packet of shop bought seeds can cost less than £2. Sometimes simply called Azur but the full name is really Azur Star. This is a purple skinned variety which is slightly unusual because it produces an excellent early summer crop. Many of the purple varieties are best reserved for an autumn crop. It is bolt resistant but it's still important to keep the soil evenly moist throughout the growing season to avoid the stems turning woody. Be wary of the seed company claims that it will survive drought. It will but the stems won't taste good! Azur Star grows well both outside or in a polytunnel / greenhouse. It can be sown for a summer or autumn crop. Autumn sown crops of Azur Star are not as hardy as some other purple varieties but should last in the ground until late October in most areas of the UK. Recommended by Bob Flowerdew, this variety will grow to an enormous size if not harvested early. A 4kg stem is a real possibility. They don't taste quite as good as some but even at their full size they are perfectly edible. They store (keep cool and moist) for a month or more. Grow this variety for novelty value rather than it's eating quality. If you think about it for a minute, a 4kg Kohlrabi is an awful lot to eat over a couple of days! Yes they store well but the minute you start peeling the skin the whole stem needs to be eaten within a few days. This is a green skinned variety which should be sown in spring (see calendar above) and can be harvested any time from June onwards depending on how large you want it to grow. An excellent green skinned variety which is best sown in spring. The flesh is more succulent than most and this variety matures quickly. For an early crop grow under cloches, polytunnel or greenhouse and sow a couple of weeks earlier than mentioned in our calendar above. As an experiment try planting this variety just 5cm apart and harvest as baby kohlrabi, we did this last year and were impressed with the results. All the normal pests and diseases which attack cabbages, Brussels Sprouts and other brassicas can attack Kohlrabi but out of all the members of this plant family they are probably the least affected. The most common problem is listed below. SYMPTOMS: Holes in leaves, generally poor plant health, the presence of caterpillars similar to those shown below or pale green coloured. The caterpillars will be most commonly seen in May and then June to August. 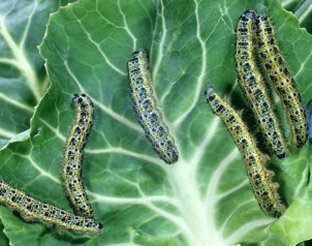 TREATMENT: For complete details on how to treat the Cabbage White Butterfly click here.